Star classical dancer (Padmashri) Geeta Chandran has been trained by a galaxy of eminent Bharatanatyam Gurus including Smt. Swarna Saraswathy and Guru K.N. Dakshinamurthi Pillai (younger brother of the legendary Guru, Padmashri Shri K.N. Dandayudhapani Pillai). Geeta has ably synthesised her eclectic classical training to present unique dance presentations in which she skilfully weaves abstract notions of Joy, Beauty, Values, Aspiration, Myth and Spirituality.Founder-President of Natya-Vriksha, where she teaches and promotes Bharatanatyam, Geeta is also Artistic Director of the Natya Vriksha Dance Company, which has travelled all over the world with its superb dance presentations. She mentors over a hundred disciples who have learnt Bharatanatyam from her for decades. 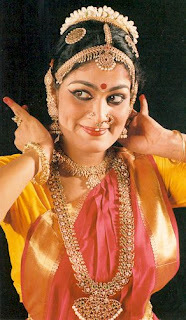 Recipient of many prestigious awards, fellowships and honours, including the prestigious national Padma Shri award bestowed on her by the President of India, Geeta is celebrated not only for her deep and composite understanding of the art of Bharatanatyam, but also for her Carnatic music (she is an accomplished vocalist), her work in television, video and film, theatre, choreography, dance education, dance activism and dance-issue journalism.A widely respected role model for the younger generation and an inspirational public speaker, Geeta volunteers her time to be on the Board of reputed educational institutions of India, both schools and colleges. She completed a term as Board Member on India’s National Film Censor Board and is currently the Government of India’s nominee on the Central Sangeet Natak Akademi’s Advisory Board and National Council. Geeta engages in the widest range of dance-related activities: performing, teaching, conducting, singing, collaborating, organizing, writing and speaking to new youth audiences. To each of these she brings a rare pedigree of style and professionalism.Geeta is well-known for her association with philanthropic causes, and has presented innumerable performances to raise funds for worthy social causes. She is most especially identified with gender issues, and her dance has addressed a vast range of gender-related issues from female feticide, marriage and dowry, women and war, women in communal situations and women as victims of human trafficking and terrorism. Her dance activism has won her equal praise.